Discover New Zealand's only castle, built in 1871 by William Larnach, merchant baron and politician, still privately owned and cared for. Featuring magnificent architecture, superb craftsmanship, tragic and scandalous history and stunning panoramic tower views. Set on 35 acres - NZGT "Garden of International Significance". With its exciting, sometimes scandalous, sometimes tragic history, its magnificent carved ceilings, antiques and breathtaking views, Larnach Castle offers you a vision of the past and present. Today the Castle is the home of the Barker family, who have spent more than 40 years lovingly restoring the building and re-creating the beauty of the 35 acres of gardens and grounds. Cafe in the Ballroom provides great meals for FIT and groups. 'The perfect setting' for functions. Enjoy our Boutique Lodge accommodation set in 35 acres of castle gardens and grounds. Includes 12 individually decorated theme rooms, each with ensuite. Dramatic sea-facing views. There is a non-smoking policy in all bedrooms. The lodge guests receive complimentary admission to Larnach Castle during open hours. Breakfast is included in the historic stable. Dinner can be arranged in the castle dining room (bookings by 5pm). There is a fully licensed café in the castle ballroom serving lunches, morning and afternoon teas and picnics to enjoy on the lawn. Larnach Castle is located 20 minutes from Dunedin city and is central to the unique wildlife attractions of Otago Peninsula. 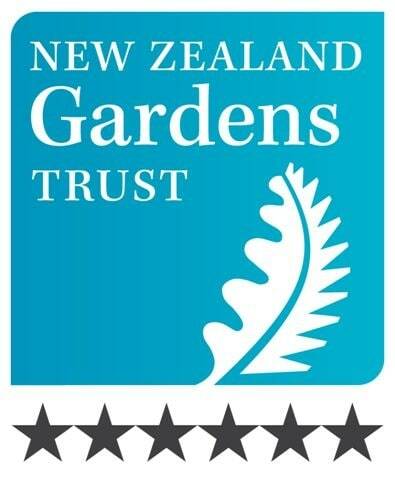 Lodge is set in a Garden of International Significance - NZGT..